LONDON (Reuters) - Britain's Prince Charles said he will stop meddling in issues he feels strongly about when he eventually becomes king, saying he is "not that stupid". The heir to the British throne has long been outspoken on issues ranging from climate change and architecture to alternative medicine, and critics have warned that if he continued as sovereign he would put the monarchy at risk. Speaking ahead of his 70th birthday next week, the eldest son of 92-year-old Queen Elizabeth said the role of monarch was completely different from his position as Prince of Wales. "The idea, somehow, that I'm going to go on in exactly the same way, if I have to succeed, is complete nonsense because the two - the two situations - are completely different," he told the BBC. Asked whether his public campaigning would continue, he said: "No, it won't. I'm not that stupid." Under Britain's unwritten constitution, the monarch is obliged to remain neutral on political issues despite in practice wielding no practical power. During her 66 years on the throne, the longest reign in British history, Elizabeth has never made public her private views. Charles, on the other hand, has made no secret of his opinions, acknowledging that challenging some orthodox standpoints had made him unpopular in some quarters. "As a teenager, I remember feeling deeply about this appallingly excessive demolition job being done on every aspect of life," Charles said in a written response to Vanity Fair magazine for an interview published this month. "In putting my head above the parapet on all these issues ... I found myself in conflict with the conventional outlook which, as I discovered, is not exactly the most pleasant situation to find yourself." In 2013, it was revealed he had held 36 meetings with government ministers over three years, while two years later, Britain's top court ruled that dozens of his letters to ministers - dubbed the 'black spider memos' because of his scrawled handwriting - could be released. Topics included rural housing, the war in Iraq, food in hospitals and the fate of the Patagonian Toothfish. U.S.-born journalist Catherine Mayer wrote in a 2015 biography that his passions had caused disquiet at Buckingham Palace and with the queen herself, with royal courtiers fearing Charles would pursue a radical style of monarchy. "He has a view of the world and he wants to impose his view of that world, so in every way he doesn't want to conform to expectations," Tom Bower, who penned a biography of the prince this year, told Reuters. "I think that if he's a rebel king, the monarchy will be in danger and I think that is the great problem we face." 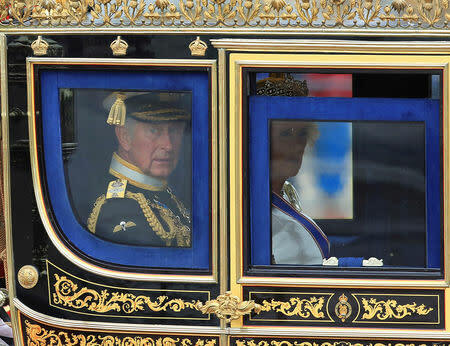 In the documentary, Charles said he would operate within "constitutional parameters" as king. "I've tried to make sure whatever I've done has been non-party political, but I think it's vital to remember there's only room for one sovereign at a time, not two," he said. "I do realize that it is a separate exercise being sovereign. So of course I understand entirely how that should operate." His supporters say his causes - such as helping disadvantaged young people find work, inter-faith dialogue and campaigning against throwaway plastic - are often prescient. Charles defended his activism as heir to the throne, which includes founding the Prince's Trust charity in 1976 to support vulnerable young people. Charles was four when his grandfather George VI died and his mother ascended to the throne at the age of 25. Camilla told the BBC his drive to get things done spurred his activism. "He would like to save the world," she said. Aides say Charles is incredibly hard-working and driven, and in the film, his eldest son, William, said he would like his father to spend more time with his grandchildren. "When he's there, he's brilliant," William said. "We need him there as much as possible."